VT is a pulse rate of more than 100 beats per minute, with at least 3 irregular heartbeats in a row. VT can occur without heart disease. 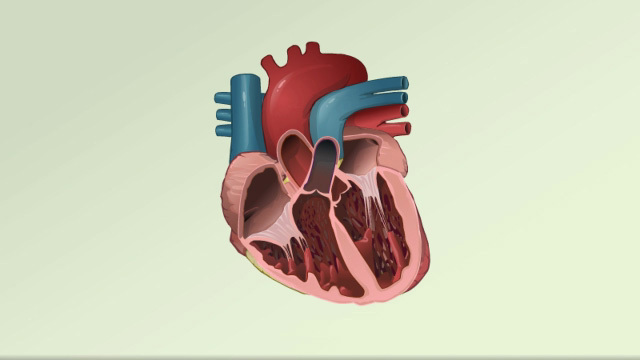 Scar tissue may form in the muscle of the ventricles days, months, or years after a heart attack. This can lead to ventricular tachycardia. "Torsade de pointes" is a specific form of VT. It is often due to congenital heart disease or the use of certain medicines. Symptoms may start and stop suddenly. In some cases, there are no symptoms. You may also have blood chemistries and other tests. Treatment depends on the symptoms, and the type of heart disorder. After an episode of VT, steps are taken to further episodes. Medicines taken by mouth may be needed for long-term treatment. However, these drugs may have severe side effects. They are being used less often as other treatments are developed. A procedure to destroy the heart tissue that is causing the abnormal heartbeat (called ablation) may be done. 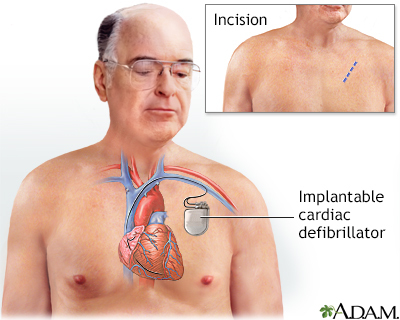 An implantable cardioverter defibrillator (ICD) may be recommended. It is an implanted device that detects any life-threatening, rapid heartbeat. This abnormal heartbeat is called an arrhythmia. If it occurs, the ICD quickly sends an electrical shock to the heart to change the rhythm back to normal. This is called defibrillation. The outcome depends on the heart condition and symptoms. Ventricular tachycardia may not cause symptoms in some people. However, it can be deadly. It is a major cause of sudden cardiac death. Go to the emergency room or call the local emergency number (such as 911) if you have a rapid, irregular pulse, faint, or have chest pain. All of these may be signs of ventricular tachycardia. In some cases, the disorder cannot be prevented. In other cases, it can be prevented by treating heart problems and avoiding certain medicines.